These are not only some really nice cufflinks - these are a subtle way to show the adventurer and archaeologist in you! 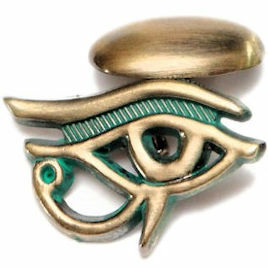 The famous hieroglyphic symbol, the "Eye of Horus" expresses the knowledge of its bearer in things mythological and historical and it is a wonderful piece of retro style from the 20s, there everybody fall in love with Ancient Egypt because of the discovery of Tutankhamen's tomb! These cufflinks are beautiful crafted and come in a nice little box to store them! I only can recommend these nice little pieces of (film)history!